Once exclusively worn on the seas, men’s boat shoes spread to shores decades ago. Premium leather, dynamic designs and detail-oriented Tuscan production make the models in our »Italian Line« the perfect sporty footwear for the modern gentleman. Boat shoes are known for leather shoelaces threaded through eyelets along the opening of the shoe, ending in a bow on the vamp above the stitched-on quarters. On our models, a U-shaped vamp insert with a crimped seam emphasizes the shoe’s similarities to the classic moccasin. It should not be confused with a moccasin, though—boat shoes, just like loafers, are in fact descendants of the famous »Native American shoe«. 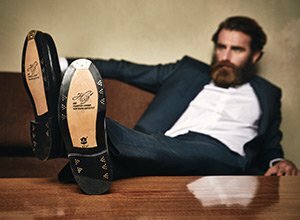 For their part, modern loafers take design inspiration from the shoes worn by sailors of the past century. At the beginning of the 20th century, sailing was an extremely popular American pastime. However, sailing shoes, which were usually made of canvas and featured hemp or crepe soles, did not provide the desired degree of traction. To make matters worse, they also left behind streaks or scratches on boat decks. The passionate amateur sailor Paul Sperry also faced this problem—to counteract it, he designed the prototype of the legendary boat shoe. Sperry thought up the boat shoe while taking a walk in the winter. Although his cocker spaniel Prince had no trouble traversing even the iciest of frozen pathways, Sperry struggled to stay on his feet. Taking the paws of his four-legged companion as inspiration, Sperry designed a leather shoe with a non-slip rubber lug sole. This sole featured etched-in grooves, or a siping pattern, that guaranteed better traction and grip on smooth surfaces. The result was so satisfying that his boat shoe quickly went into production. Shortly thereafter, it became popular on the mainland as well. Over the years this onetime sailor’s shoe has become far more suitable for wear on land. A thicker rubber lug sole, separate protective insole, and soft lining elevate the comfort of modern boat shoes such as the ones included in our »Italian Line«. Despite these innovations, the basic cut of the shaft has remained unchanged—it still exudes a distinctly nautical flair. Designed in Berlin, our collection of boat shoes has masterful Tuscan production to thank for its extraordinary quality. For all men who find trainers a bit too sporty and classic lace-up shoes a touch too formal, the boat shoe is the perfect choice for sophisticated leisure activities. While they are obligatory for sailors, men’s boat shoes have also been popular among landlubbers for decades.